Today marks the start of my favourite “challenge”- Mindful In May (MIM). This will be the third time I have participated in MIM and the benefits for me have been noticeable, significant and sustained. For example, I find it much easier to deal with negative emotions within myself and also from others, I am able to “switch off” from worries rather than get caught up in them, I eat more mindfully which helps to recognise hunger and fullness cues, and I can achieve a state of relaxation within minutes. Just like our bodies need regular training to keep fit, our minds need training too to function at their best. Mindfulness is really a form of mental training that supports the mind to be more focused, clear and calm and enhances our emotional intelligence. Mindfulness is a particular type of awareness that develops through the practice of mindfulness meditation – a technique of paying attention, on purpose, to the present moment with openness, curiosity and non-judgement. 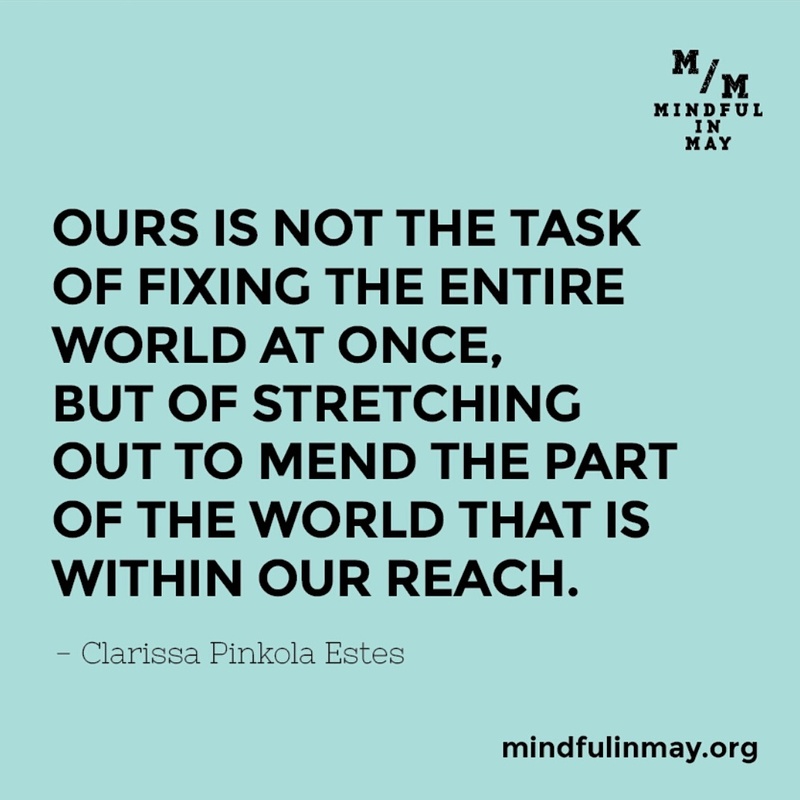 Through the regular practice of mindfulness one develops more focus, concentration and capacity to respond effectively rather than react impulsively to life’s daily challenges. Join my team: Mindful4Life so we can pool our fundraising efforts and watch our impact as a team. We can also keep each other motivated. If we’re amongst the top 10 fundraiser teams we’ll be featured on the MIM website and spotlighted on their social media as a Mindful in May champion. If you have already signed up but would like to be part of my team, send me a message and I will transfer you over. Come June your brain will be re-wired for the better with greater clarity, calm and focus. You’re fundraising will have transformed the lives of thousands in need. It’s a win, win. Clear mind for you, Clean water for others. NB: The registration fee is not a donation but helps to keep Mindful in May running each year. Donations to Charity Water are not tax-deductible outside of the USA. What is the one way you would like mindfulness to help transform your life for the better? This entry was posted in Emotions, Mind, Mindfulness, Psychology and tagged acceptance and commitment therapy, cognitive defusion, meditating, meditation, mindfulinmay, mindfulness. Bookmark the permalink. 3 Responses to Become Mindful4Life with me! It’s official! Booked in to see your mate, Russ for two days in June.